*PBS Masterpiece Theater's series "Downton Abbey" examines difficult class and social issues between lords and the serving class. fascinates me. *also on PBS Masterpiece Theater: a great twist on one of my personal favorites, "Sherlock" features Sir Arthur Canon Doyle's famous characters set in the 21st century. and it's hilarious. you will have to find the first season on netflix as pbs only shows repeats for a limited time. *True Grit: had the pleasure of seeing the new version with my mom-in-law, Judy. very aptly named movie. highly entertaining. *The Fighter: i know i've mentioned this already, but it is just that good. mind the profanity. it's boston, what do you expect? i, of course, was not bothered by the cussing. shocker. amy adams was feisty and awesome. christian bale...very deserving of the award nods he's received. *The King's Speech: true story about england's prince albert and his speech impediment. so clever. colin firth, as ever, was incredible and witty. laughed out loud deliriously. my favorite scene is when albert discovers that he does not stammer when he's angry and swearing...had me snorting i was laughing so hard. don't judge for thinking swearing is funny...it is british cussing, which is somehow less offensive and more than a little charming. one of the many injustices of life, to be born without an interesting and charming accent. 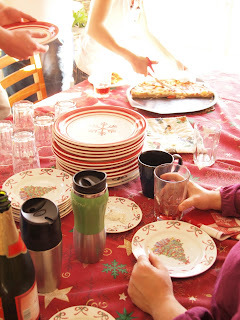 christmas which prompted the question: "what utensils can you not live without?" i realized that i'm fairly simplistic, i need a GOOD chef's knife, but it's pretty much the only knife i'll use; wooden spoon, a classic; kitchen shears for trimming fat and tendons off of poultry, cutting that too-large-for-the-toaster slice of bread, and opening those ridiculous bags of shredded cheese that say "tear here" but always manage to screw up the resealing zipper (you know what i'm talking about, i'm sure of it); a good spatula; and measuring cups (i RARELY bake, for which purpose i'm sure measuring cups are essential, however i use them for measuring and estimating food portions...see useful thing #2). obviously, these are not the only utensils that i use in the kitchen, but definitely the most frequent flyers. so, what are your essential utensils that you can't live without? *online food journal: i've kept a "journal" of the food i eat since november and it's made me a MUCH more conscious eater. i've not really changed what i eat, still allowed myself to have all of my favorites (popcorn at the movies, coke, cheese, CARBS), but i feel much more knowledgeable about how much i'm eating, portion control, planning ahead, and creating balance. so (fingers crossed! ), we'll see how it goes! *my bike: since the stress fracture (or the almost-stress-fracture), i've not been able to run or play soccer or anything high impact. therefore my bike has been my best friend! also useful is the trainer that it sits on that allows me to ride inside, like a stationary bike, instead of having to hit the frozen roads in january! *food processor: this was a gift from my mom and i haven't even used it yet but i have loads of plans for it! can't wait to make pesto and use it to try so many new recipes! 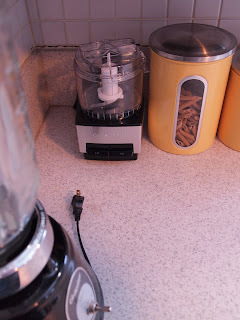 right now, i just have ideas in my head, so if you have favorite pesto recipes or any other recipes involving the wonders of a food processor, do tell! that's the short list of my useful things. later this week: more pictures of found objects from my parents' basement, the back of the drawers under the stairs, and etsy. also, a post highlighting the buchheister family "christmas" in january. 1. Deal with what comes through the door (mail, keys, coats, shoes, etc)...still working on that one. don't really have a great system. 2. 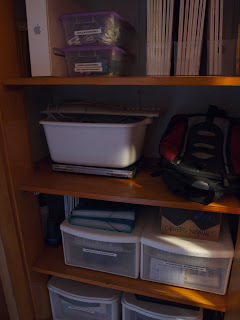 Deal with dishes, recycling, composting everyday after dinner so it doesn't start to pile up. 3. Set the timer for 20 minutes! so far, the daily task has taken longer than 20 minutes/day (about 45-60ish) but i'm thinking that if i keep up with the list, it will get more and more efficient each time. if i am sweeping all the floors 3 times a month, for example, instead of once every 2 months (embarrassing!) then, it will not be such a big job each time. problem is, now the look of it is kind of growing on me, so i'm debating whether or not to actually paint it. i wanted to paint it a glossy lemony-mustardy-yellow like this, because you may notice a theme in our living room: A LOT OF BROWN (big brown bookcase, big brown piano, brown hardwood floors, brown couch, brown, brown, brown). i need something different, something exciting. so, dilemma #1 is to paint or not to paint. what do you guys think?? ok, but let me get back to how this led to my organized closet. so, we switched out the new found dresser after taking down c-mas decor for the old dresser-acting-as-tv-stand, which lead to kirk having to finally clean out his junk drawers from the old dresser. hideous. i tried to set up a little drawer for keys, phone books, etc and kirk soon absconded the drawer for papers, batteries, loose change, cords, cables, and all sorts of things that i have no idea what to do with. so we spent HOURS zip-tying all of the cables, sorting everything into categories, and i got to make labels for all the plastic bins accordingly. i love labels. so now, dilemma #2: as you see from my living room pics above we have a lot of woodwork in the house (door frames, window frames, baseboards, etc) and we are debating whether or not to paint them white. our main objection: a lot of work. we're kind of lazy, ultimately. but really, we both prefer white painted woodwork unless the woodwork is HIGH quality, which ours is NOT (which you could see from closer up...most of the varnish is sticky, wood is cheap, and in a few rooms the window sills have so much sun damage that we really need to refinish them anyway, but to take on the whole house...whew!). 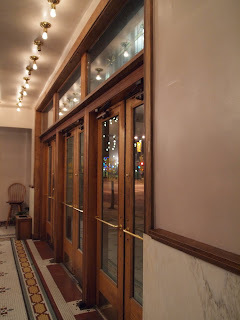 almost every home in design blogs or magazines that i love has white painted woodwork. we really have to decide before we start our bathroom project because we are going to gut the bathroom and whatever we put in there for baseboards and windows i will want to match the rest of the house, so...what do you guys think?? 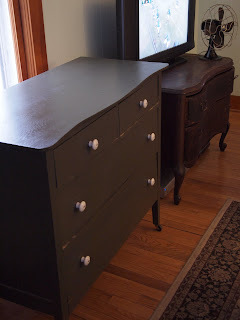 lastly, and not really a dilemma, i had an idea of what to do with our previous dresser-as-a-tv-stand (pictured on the left below). i think i may paint it with blackboard paint and put it upstairs in our future attic-guest-room-playroom-media-room. i have wanted to use blackboard paint for something, but really don't enjoy using chalk at all (hate the chalk-under-the-finger-nails thing). so, i thought i could turn the dresser into a "toy bin" of sorts, filling the drawers with sidewalk chalk, crayons, markers, craft supplies, toys, and kids books for when we have the nieces and nephews over. my worry: by the time i make this attic-playroom-etc a reality all of our nieces and nephews will have grown! kirk says that by then it will be our nieces and nephews' children playing in our attic-playroom! 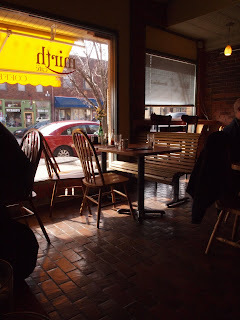 *good idea for brunch in lawrence: Mirth. kirk and i frequent Mirth almost every saturday and always order the same things. for kirk: a "short" stack of honey whole wheat blueberry pancakes and coffee. for me: a half order of vegetarian biscuits and gravy and a half spinach and pear salad (yum!). downside? 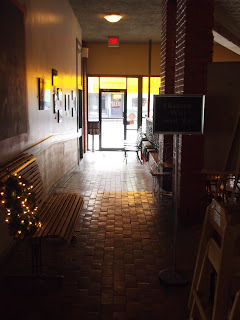 smelling of roasterie and onions (rather like the famous "Radina's smell" from our fave coffee shop in Manhattan). 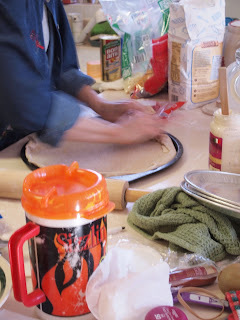 *good idea for a family tradition: making homemade pizzas. growing up, my family made homemade "buchheister pizzas" which was only appropriate considering mom and dad met when they worked together at pizza hut during college. 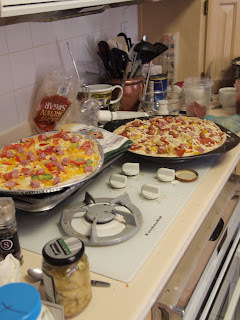 my personal journey with pizza has continued with kirk's family tradition of making a dozen different types of pizza at christmas: pepperoni pizza, bbq chicken pizza, veggie pizza, chicken and bacon alfredo pizza, shrimp pizza (not MY personal fave, but it seems to be rather popular with everyone else),you name it. just make sure you come with a ready appetite! 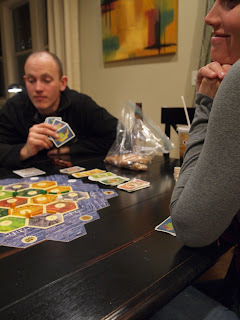 *good idea for a game night with friends: settlers of catan (nerds, i know). the davidsons and hutsons have a fairly competitive, yet amiable, board game relationship as you can see. *good idea: visit a local movie theater that shows indie films. in lawrence, that would be liberty hall. really i just wanted to share photos taken with my new camera. *good idea for a movie night: and my favorite movie of perhaps the last year: the fighter. christian bale...so good. marky mark (i don't think he still goes by that name...), also wonderful. definite favorite. and to complete this post of celebration i must acknowledge that the chiefs made a most improbable turnaround this season and are heading to the playoffs for the first time since 2003! although i am still reeling from the shock of our heinous performance last week against the raiders (did our offensive line conspire with charlie weiss against matt cassel or am i being paranoid?? ), i really believe that the equation for success against baltimore is not outside of our reach. my keys to the game (by the way...my journalist cousin, josh, despises amateur bloggers that charade as sports writers, so i make this disclaimer: i am not claiming to be a professional sports analyst or journalist! i promise, josh! just my opinion! plus, i am too scatter-brained to keep a sports-only blog, as my reader friends all know). anyway, back to my keys to the game: run, run, run the ball. involve d. bowe early in the game. stop the run (baltimore's passing numbers are not great so we HAVE to stop their running back, ray rice...he is the biggest threat against us). no excessive going-on-4th-down decisions (ahem. todd haley). no turnovers. these are the strengths that we have shown in our wins this season, and really, this is not breaking news or rocket science, just really good ideas. go chiefs! happy new year everyone! i'm not really one for making resolutions (i feel pretty strongly that if something is really important, i ought to do it immediately regardless of the day of the year... although i also think that at times milestone markers are important for setting goals... so i guess i can see both sides), however one of my goals is to tackle a few of the unfinished projects around the house (hello, kitchen cabinets!) and to take more pictures. although i don't always like to finish projects, i'm never wanting for ideas and my etsy cart is certainly swelling with little bits and bobs that i want to add to my home decor. here's a few more finds from the past year that did not make previous posts for lack of photos. ahhhh, but i'm finding it much easier to take interesting photos with my new camera! later this week, i'll post more photos from my new camera. but for now, here's a few shots of my second-hand treasures! 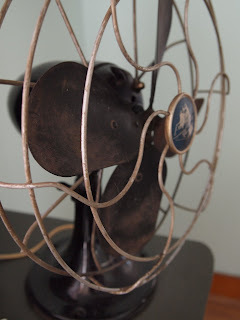 vintage emerson fan found on craigslist; just needed a little cleaning and still works! freebie snare drum we received as a white elephant gift (no one with children wanted to "steal" it from us... i wonder why). not sure what to do with it, but for now it occupies the corner next to my bookshelf. 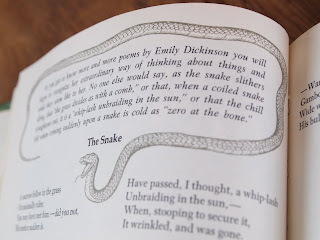 freebie vintage illustrated children's nursery rhymes book from the 1950's; one of many books i salvaged from my school's library give-away last year... could not pass it up with these awesome illustrations. not sure what to do with it, how to display... the front cover is drab and dreary... maybe i'll just leave it open on the coffee table??? photo book and biography of dorothea lange, one of my favorite photographers of all time (dust bowl era, migrant workers, etc). found at 1/2 price books and purchased for $6! i am in mourning for the inevitable end of my winter break... i feel i've accomplished quite a lot while not actually having to change out of my pajamas on most days for the past two weeks. my accomplishments: took lots of photos, learned (-ing) a new camera, drove to dodge city (to spend time with grandma, cousins, uncle, parents), drove to burlington (to spend time with kirk's fam), had lunch with erika, read 3 or 4 books, rode my bike, did yoga once (yes, exactly one time), made homemade pizzas (with kirk's mom's side of the fam), went to kc to hang out with friends, watched LOADS of football and some basketball, played settlers of catan with the davidson's, ate icing and graham cracker sandwiches with the sandefurs and rex, watched ksu vs. unlv live at the sprint center, and SLEPT (shamefully, that was probably my most frequent activity)! i'd say that's quite a lot to squeeze into two weeks! well, Sleep, it was nice to know you. i will visit you again in march for spring break for tomorrow it is back to school!